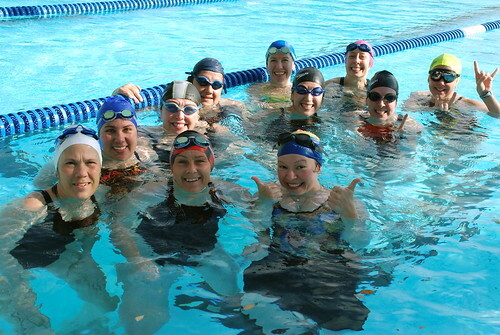 Happy Mermaids on the last day of the Spring mini-session. Coach Sara welcomes all mermaids to join her in the Balcones Pool on Tuesday evenings for a mid-week Happy Hour swim to keep cool and refreshed as the warmer weather approaches. This is an additional optional uncoached swim session for any mermaid veteran. The pool is open from 5:30-7:30 so you can hit the deck any time during that window, but Sara plans to swim at 6:30 pm. The cost to get into the pool is $2. If you’d like to join in check in with Sara. Statesman reporter Pamela LeBlanc talks with Sally Edwards and straightens out the confusion between the Trek and Danskin triathlons.